I have been in love with Kittee Berns’ cookbook since it came out, and I can’t believe I’m just telling you about it. Better late than never, right? 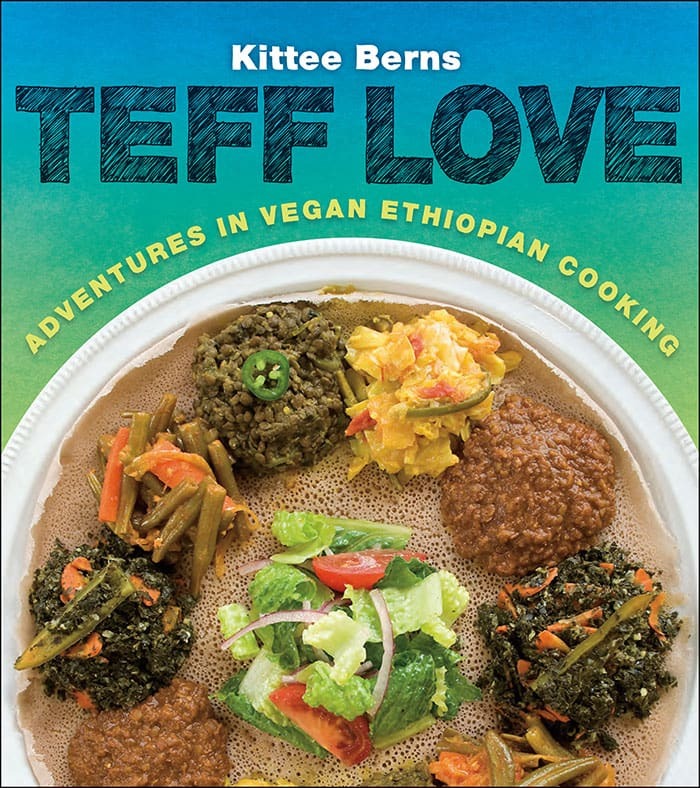 Her book, Teff Love, is full of Vegan Ethiopian Recipes – one of my favorite cuisines! If you haven’t had much Ethiopian, you are in for a treat! It’s full of lentils, vegetables and gluten-free bread made out of teff flour. You don’t use silverware when eating Ethiopian. Instead, you tear off a piece of the bread and use it to scoop up the delicious stews. The book is full of great recipes including how to make the basic spice blends and even a quick way to make the bread. The book is full of recipes for breakfast, apps, spicy stews, mild stews, legume-based sauces, veggies and casseroles, and so much more. Today I’m sharing 2 recipes from Kittee’s book. 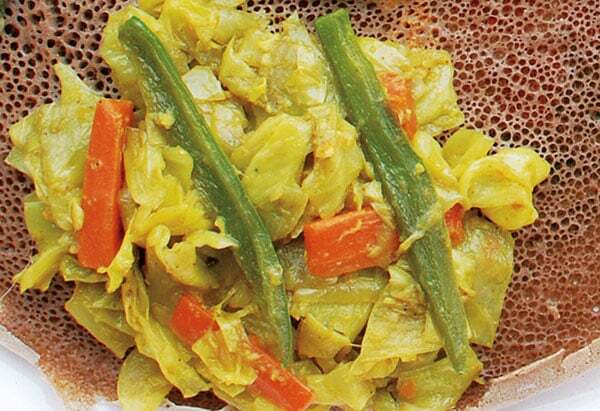 The first, Ye’tikil Gomen Be’karot, is a mild cabbage, carrot and green bean stew that’s one of my favorites. The second recipe is the quick way to make the bread, so you have something to eat the stew with! Sweet, tender, stewed cabbage with meltingly soft carrots in a mild gingery sauce. 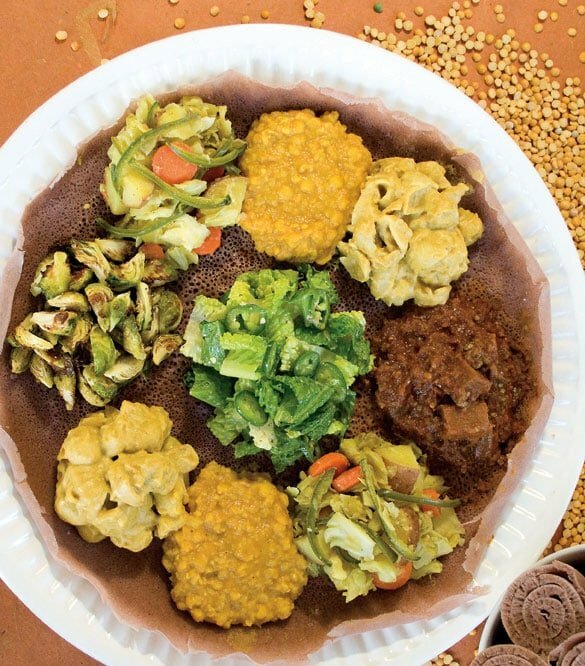 Although the ingredients in this dish are almost identical to those in Ye’tikil Gomen Be’timatim (page 122 in Teff Love), the result tastes completely different. Stir in the turmeric, cardamom, and cloves and cook for 1 minute. Add the cabbage and water and stir well to combine. Cover and cook, stirring occasionally to prevent scorching, forn10 minutes. Add the chiles, cover, and cook until the cabbage is very tender and the carrots are soft, about 5 minutes longer. Season to taste with pepper and additional salt if desired. Although these crêpes don’t have quite the same texture or pronounced sourness typical of teff injera, they make a good stand-in on days when you want Ethiopian food quickly and don’t have time for the fermentation process or access to commercial injera. They have a slightly spongy-stretchy texture, with a small bit of tang from the yogurt and vinegar, and work well for scooping up sauces and stews. Preheat a nonstick skillet (see cooking tip) over medium heat. Form each crêpe by using a 1/3-cup measure to scoop the batter from the bottom of the bowl and pour it into a disk on the hot pan. Use a spoon to quickly and lightly smooth the batter into a 6-inch disk, starting in the center and working in concentric circles until you reach the edges (keep the center of the crêpe the thickest and the edges the thinnest; the crêpe should be between 1/8 and ¼ inch thick). Cover and cook for 1 minute. The crêpe should be dry on the top with a smattering of little holes over its surface. Uncover and continue to cook the crêpe without turning it for to 1½ minutes. The total cooking time for each crêpe should be 2 to 2½ minutes. When fully cooked, the crêpe should be dry on top with a few air-bubble holes, and the bottom should be firm, smooth, and lightly browned. Depending on your cookware and stove, you’ll need to adjust the heat to achieve this result. Use a flat, flexible spatula to loosen and release the crêpe,and then quickly transfer it to a plate and cover with a clean,dry tea towel. Repeat the cooking process until all the batter has been used. As the crêpes are made, stack them on top of each other and keep them covered with the towel so they don’t dry out. As they cool, the crêpes will develop a spongy-stretchy texture. Let them rest until <g class="gr_ gr_255 gr-alert gr_spell gr_run_anim ContextualSpelling" id="255" data-gr-id="255">they’re</g> room temperature, then wrap the stack loosely in a clean, dry tea towel and seal it in a ziplock bag until serving time. Be sure the crêpes are completely cool or the bag will collect moisture and they’ll spoil. If you notice any condensation, open the bag to air it out. Cooking Tip: For the best success, I recommend cooking these crêpes on a flat, anodized griddle or pan. If you find the crêpes are sticking as they cook, mist the pan with a small amount of oil. Keep in mind, just as with traditional teff injera, the first one cooked is usually a throwaway or a treat for the cook. Cooking Tip: Halve this recipe if you’d like a smaller yield, and for the best results, eat these the same day they’re prepared. dry on top with a few air-bubble holes, and the bottom should be firm, smooth, and lightly browned. Depending on your cookware and stove, you’ll need to adjust the heat to achieve this result. 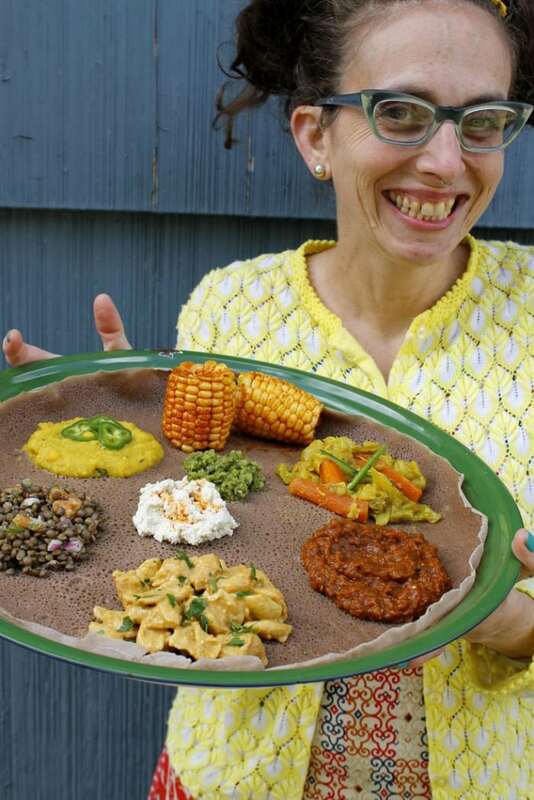 I’ve never tried Ethiopian food, but Kittee makes it look so delicious! Am I missing something? There’s no mention of Ye’quimem Zeyet in the ingredient list, and yet it’s mentioned in the recipe. I copied the recipe from what the publisher sent me. But Ye’quimem Zeyet is another recipe that makes a flavored oil, and I suspect the olive oil takes its place. I have made the Injera recipe twice and both were great. My question is how long can I ferment the batter? The recipe in Teff love is for 3 days, and I need an extra day. Is that safe to leave out one day or can it be refrigerated? Thank you. Since it’s Kitee’s recipe and I’ve always used mine in 3 days.